I often feel badly that I don't write more often here in this space. I really wanted it to be an almost daily journal of our goings on. I hadn't written since February and decided I'd quickly write the April Ruffle post to join in Ginny's fun. I was careful to assign Mae, age 2 1/2, to her sister for a few minutes of watercolor artistry and playing giraffes. Apparently things didn't go as I thought they were going upstairs and her sister (who shall remain nameless) got distracted. Mae was found, seven minutes after I began writing the blog post, on the floor painting her toenails. The child needs Constant. Parental. Supervision. To her credit, she did not get a single drop on the floor. This week’s Poetry Friday roundup can be found at Scrub-a-Dub Tub. Tess and I like to walk outside in the late afternoon when the sun is low in the sky and the shadows are long. She lies in my arms, looks up at the trees and listens to the birds singing. Like a little monkey clinging to its mother, she holds onto my hair which is now several inches past my shoulders. I know it is instinctual for babies to grab onto whatever is placed within their reach but there is something so loving about how she holds my hair that I get a little choked up inside every time she does it. Eventually, her eyelids become heavy and she dozes off, snuggled in my arms, still holding onto my hair. I can't help but wish that I could stop time and stay forever in the woods with my baby, listening to the wind and the birds, the sun shining on our faces through the trees. She can hold my hair and I can carry her in my arms and keep her safe as long as we both shall live. That would be wonderful, wouldn't it? I have always been the type of person who, when learning about a certain subject or topic, immerses myself in as much information as I can gather. These temporary "obsessions" last while I sort through the information that I will use and that which I will discard. When I was in my mid-twenties and pregnant with my oldest child, I read all I could get my hands on about pregnancy, childbirth and parenting a newborn. Many of those books I borrowed from our local La Leche League's travelling library. I would borrow them at one weekly meeting and return them the next, anxious for more to digest and with which to identify. Out of all of the books I have read about parenting, babyhood and childrearing, very few stand out as being life altering. I can count on one hand those that made a profound impact on me, those that made me stop and pause. But those few special books and their authors gave me the understanding and compassion to seek to understand my baby, to grow in confidence as a mother and to know that other mothers have traveled the same road. They speak to my heart with both their words and their deep respect for the dignity of the child. Oddly now, in the middle of my life, I have had a renewed interest in parenting books. In my years as a mother, I have had two babies that were what most people called "colicky". They cried, sometimes for hours each evening, despite my efforts to make them happy. I remember being quite exasperated that no matter what I did after they were fed, burped and changed, no matter how much I walked, bounced, jiggled or sang, their crying never ceased. My newest little Teresa is one of those two babies. She spent a good portion of her first few weeks crying inconsolably even after all of her immediate needs were met. I recently finished reading two wonderful books by Aletha Solter, The Aware Baby and Helping Young Children Flourish. I am so happy that I read them. Her thoughts on crying, tears and tantrums were enlightening. You see, I have spent most of my children's childhoods not knowing how to deal with tears. Certainly, I have been sympathetic to skinned knees and hurt feelings. Those are the easy feelings to handle as a parent. But, there is a huge grey area when it comes to tears. What about the child who cries because he/she does not get their way while playing a board game? What about the child who cries because you served them the "wrong" cereal in the "wrong" bowl with the "wrong" spoon? What about public crying or tantrums in a grocery store? I will admit to being less than understanding when it comes to those displays of emotion. I tend to want them to end. And quickly at that. Solter explains that tears and crying are therapeutic both physically and emotionally. The human body releases stress by crying. There is a positive hormonal response that occurs when tears fall from our eyes. Humans who physically cannot produce tears (a disorder called Riley-Day syndrome) have high blood pressure. They sweat profusely in order to release toxins from the bloodstream and fat stores. So crying is not only necessary for emotional release but for physical health as well. The author deals specifically with the topic of newborn crying in The Aware Baby. She advocates attachment parenting (though she does not use the name as the original publication of her books predates that terminology). Breastfeeding, sharing sleep and being responsive to baby's needs are encouraged. However, she tells parents that sometimes a baby will simply need to cry. Often they have been fed, burped, changed, rocked, conversed with and held but they are still crying. Solter encourages parents to allow it, to not feel guilty about it or try to "fix it", that crying has a good purpose. Does this sound like the school of thought that encourages parents to let their baby "cry it out" alone? Quite the opposite. The baby should be held while crying, not left alone to emotionally fend for themselves. The benefits of crying while being held are that babies who release stress this way are easier to live with. They are more pleasant , content and alert. They sleep much more soundly at night and for longer stretches because they do not have pent up negative emotions. Allowing and encouraging crying in babies and young children also helps to prevent later psychological problems. When it comes to older children, there is very little difference in the approach of how to handle tears. They should be allowed and encouraged when necessary. Oftentimes we are uncomfortable with an older child's crying because it is less socially acceptable for them to show emotions. However, they can be encouraged to retreat to a bedroom or another less public place when needing to cry. It is not often necessary to hold an older child. Just keeping them company and acknowledging their emotions while they are being expressed may be enough. I can only imagine what the world would be like if each and every one of us had parents who held us while we cried and told us it was ok to do so, parents who were comfortable with our emotions and looked at us with love in their eyes. What a lovely legacy of peace to pass on then to our own children. And to their children as well. was born July 26 weighing 8 lbs 10 oz and 20 1/2 inches long. Welcome to the world, beautiful blessing! The girls and I had recently read One Morning in Maine by Robert McCloskey which is a lovely, slow-paced book about one girl's adventure with her first lost tooth. Mary loved the book but, weeks later, became somewhat obsessed with her own first loose tooth. She feared she would swallow it or that it would fall out in her sleep. She was not certain she liked the idea of the Tooth Fairy. Finally, the tooth came out and she is much happier. She now shows everyone she meets the hole in her mouth and tells them that she is officially a "big girl". 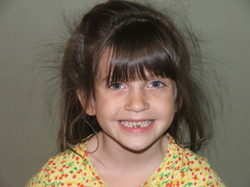 Here is a photo of her new smile, if you can see past the crazy hairdo (not sure what's going on with that--let's pretend she had just woken up that day :). Generations of children have grown up hearing that song each and every day. Today, I stumbled across this website . 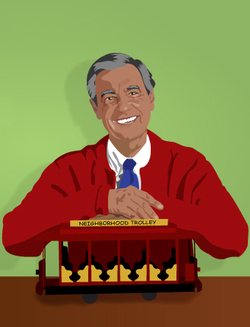 It is a grassroots site dedicated to saving Mr. Roger's Neighborhood show from extinction. Did you know that starting this month PBS is no longer going to air a daily syndicated broadcast of Mr. Roger's Neighborhood? For years, Mr. Roger's Neighborhood was the only show my children were allowed to watch. We joined Fred Rogers faithfully every weekday at 12:30, right after lunch, right before naptime. Now it is on in the wee hours of the morning but we have been TiVo-ing it for some time to watch later in the day. Anyone who has watched Mr. Roger's knows his love and respect for children is great. His show, for years, was the only one left that was still being filmed with one camera. The camera panned as Mr. Roger's walked through his home and about town. This allowed growing children to digest the images without the constant, erratic switching from image to image, (which is often though to contribute to Attention Deficit Disorder). If Fred Rogers has touched your life or the lives of you children, please consider writing to PBS and telling them that you'd like the show to remain. or contact PBS online at this link. I thought you might enjoy seeing Mr. Roger's final word to parents. It makes my eyes tear up just watching it. Here is a clip of Mr. Roger's acceptance speech of the Lifetime Achievement Awards. I am just so inspired by his humility and selflessness. Last autumn, we began having a daily Circle Time for the little ones. My children have responded so well to this small amount of structure, movement and attention in the morning. Here are some previous posts about Circle Time in our home. Morning prayer: "Dear Lord Jesus, I give you today, all that I think and do and say. Amen." Closing Prayer: May my hands work with care, my heart work with love and my mind work with attention. Amen. Have a child blow out the candle. Immediately following Circle Time, the older kids work at the table on their lessons. Prior to adopting Circle Time, the girls were disruptive and were constantly demanding attention during the boy's table lessons. I have found the girls are happy to play quietly for an hour or so after having had the attention and interaction that Circle Time provides. I make available a different toy each day for them to play with. This is the schedule we used last year and it will work fine again this fall. Rotating the wooden toys keeps them from becoming "old hat" and gives the girls a pattern of play to look forward to each week. I keep each of the different toys in a separate container that I carry up from the basement after Circle Time. This has worked well for us thus far. The birds have been singing, the flowers are blooming and all has come alive in our region of the country. 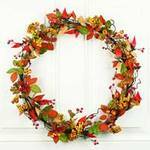 So, we will be changing our circle time songs this week to reflect the lovely Spring season. The upcoming month of May is devoted to The Blessed Mother so the hymns we will be learning are Marian. The songs, fingerplays and poem will be about animals, weather and gardening. We begin by lighting a candle, mentioning the current day and date. We then make a Morning Offering: "Dear Lord Jesus, I give you today, all that I think and do and say." Closing prayer "May my hands work with care, my heart work with love and my mind work with attention. Amen." The children blow out the candle. More on circle time in our home here and here. Just wanted to take some time to address a few of the questions that were asked following my recent post about Circle Time. "What do you do if you have toddlers mixed in with older children? How do you plan songs for differing ages?" That is a great question. My oldest son (11) does independent table work while the rest of the children (8, 4, 2) do circle time. I try to include some traditional nursery rhymes for the littles, some songs with hand motions and some livelier, patriotic tunes for my eight year old. Anything involving marching or military seems to be a hit for boys. :) The girls current favorite is A Ram Sam Sam. Here is a video clip from UTube, though we don't do the "Olha a Onda" part, but rather sing the "A Rafi" version. "What music sites or sources do you use to choose the songs and, fingerplays?" Two of my favorite songbooks are Rise Up Singing and American Folk Songs for Children. Both are dog eared books that I have used since my oldest was a baby. We have never done a formal Circle Time prior to this past fall but I have sung to my children since they were tiny, especially in the car. The Rise Up Singing book has a myriad of songs by topic, plus guitar chords for those of you who play. The book is spiral bound, which I love. There are a few songs in it that I would never sing to my children but the good far outweighs the bad. I would encourage anyone who is tempted to just play the songs for their children from a CD player NOT to do it. Play them for yourself so you can learn them but sing them to your children. Your kids don't care if you are not the best singer. They love you and want to have fun with you! I love to teach the children folk music because it is so richly steeped in our country's history. So many of the songs were passed on from generation to generation, sung on the prairies, the cattle ranges, and the battlefields of our country. "LOL!! I tried it Rebecca. Now you said that the children wouldn't mind my singing voice, but when we began The Itsy-Bitsy Spider, my three year old son curled up in a ball on the floor and began to sob. What did I do wrong??? :) Too funny"
I smiled when I read this because Mary Kathryn put up quite a fuss the first few days that we did circle time. In our case, it was that she was not accustomed to having a lot of fun and personal attention in the morning. I think the structure and stimulation was a little emotionally overwhelming to her. After a few days, she began to ask for circle time but initially, she was very disruptive. (I really doubt it has anything to do with your singing voice! :) ) My guess is either the overwhelming interaction of it all or that your son is afraid of spiders. LOL! It is helpful when doing circle time with little ones to arrange the songs in such a way that there are quieter songs in between the large motion, louder ones. That seems to help the children to settle and calm down after much excitement. Above all else, don't give up! Little ones really thrive on routine and circle time is a gentle way to introduce a morning rhythm. I hope I did not forget anyone's question. If I did, feel free to resend it again. I would add "and moms" to that famous line. 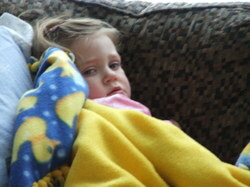 The children are sick, Annie feeling the worst with a fever, croupy cough and very restless sleep. Her nose is stuffy and her cheeks are pink. Our plans have been knocked flat again by the stuff of life. I have spent the past twelve hours feeling sorry for myself as I have done under these circumstances in the past. I think I am over it now. All of the extra lesson ideas I had hoped to accomplish with the children, the Lenten crafts, the purging/organizing and the visting with friends have all taken a back seat to the little girl in the pink nightgown. And so it should be, but it is stretching and it hurts when our plans do not work out the way we'd like. Motherhood is full of opportunities to die to self, both voluntary and involuntary. So, here I sit, holding that pink bundle, listening to her heavy breathing, kissing her forehead and saying little prayers for her. Please, won't you do the same? And while you are at it, please utter an Ave for me as well, that I will embrace God's plan, in both the big and small, even when it differs from my own. Perhaps this is my Lenten journey, not the crafts and charts and plans I had hoped for, but the giving up of my need for control, the resting in a plan that is bigger and better than I can imagine. This past fall we decided to add circle time to our daily rhythm. Circle time is simply a gathering time at the beginning of the day in which to sing, read poetry, do fingerplays and incorporate movement. I have always felt that it would be a good idea for my littles to have some sort of organized activity before I start tablework with the school aged children. Circle time takes about twenty minutes to a half hour each morning. I try to alternate songs that are lively with much movement with those that are quieter and slower. This seems to keep the children's attention quite well. Last fall, I arranged a repertoire for the children. We ended up repeating the same song list for the months of September, October and November. I intended to arrange something for Advent and Christmas but it fell by the wayside. I will include a few songs, a poem, a fingerplay and a hymn each time I come up with a new list. Below is what I have planned for the remainder of winter, until late March. I read somewhere that it is important for the children that the list of songs, etc. remains the same for several weeks or even months before changing to a new list. Small children love consistency and find much comfort in repetition. Christopher sits in on circle time so I have tried to add several songs that would appeal to him as well as my toddler/preschool daughters. Say Morning Prayer "Dear Lord Jesus, I give you today, all that I think and do and say." If you are interested in beginning a gathering/circle time in the morning with your children, choose a few folk or nursery songs that you'd like them to learn, a poem perhaps and a fingerplay. Start small. Don't be afraid that you do not have a nice singing voice. Your children will not notice or care. They will have fond memories of spending time in song and play with their mother and siblings. The girls and I recently returned from a five day trip to Florida where we visited my 91 year old grandmother, Kathryn. Kathryn has a ranch home of her own about ten minutes from the sea where she has lived for the past 60 years. She and my grandfather lived there together until his passing 12 years ago. Her home has no microwave, no dishwasher, no internet service. It has one rotary telephone and a television that catches three channels which is only turned on for Jeopardy and the evening news. She makes her coffee in a stove top percolator. She reads the newspaper and does the crossword puzzle each day. There are many things that I learned from this visit with my grandmother which I plan to blog about but the one thing that most interested me was the way time passed slowly while we were there. There was something so soothing and beautiful about her peaceful life. She was interested in only the task at hand. Whether it was cooking bacon, crocheting a cotton rug or rolling Mary's hair in rag curls for the night, she was fully there. There's no multi-tasking in my grandmother's world, just a slow, steady persistence and an enjoyment of it all. Grandma ran the sprinkler for the girls to play in each day. She also filled a small tub of water for them to soak in which she put on her back patio. I thought it would only be a matter of minutes before the girls lost interest in the little tub of water. Grandma supplied them with some plastic cups and they played for hours. Hours! We sat in lawn chairs and watched them, laughing at their crazy antics and letting them pour water on our tired feet. Each night at around eight o'clock the girls grew sleepy and we put them to bed together, plum tuckered out from a full but simple day. Then, all the dishes being done right after dinner, Grandma and I sat and played rummy or Skip-Bo and talked for the rest of the night. There was no mad rush to get on the computer, no turning on the television, just the sound of the crickets and the gentle hum of our conversation. I have made it my goal to bring some of that peace home from Kathryn's house. I hope to slow things down here a bit, to take it one thing at a time and savor the rhythm of each day. I want my children to remember the crawling of time and the enjoyment of a simple life. I do not want them to remember a mother who spent her days staring at a computer screen, unavailable and unfriendly. I want them to look back and remember their mother sitting in the lawn chair, sipping a lemonade, with nowhere to be but right there. The Works of Herbert Ratner, M.D. Dr. Herbert Ratner was a Catholic physician who was instrumental in the health and nutrition chapter of the original edition of The Womanly Art of Breastfeeding. A 54-year resident of Oak Park, Illinois, Ratner was director of the city's Department of Public Health from 1949 to 1974. A visiting professor of community and preventive medicine at New York Medical College, he was also associate clinical professor of family and community medicine at Loyola University where he was director of student health and where he taught a course in medical ethics for many years. In the 30s and 40s he served as scientific consultant to Robert Maynard Hutchins, president of the University of Chicago, and to the Encyclopedia Brittanica. Dr. Ratner's family has recently released a collection of his writings entitled Nature, the Physician and the Family which are available in book form or as a download. Dr. Ratner's daughter, Anne, is a dear friend of mine and has helped form my thoughts and practices on raising babies and loving my children. Here is an article by Dr. Ratner entitled The Infant as a Human Being. I thought many of you who are interested in Montessori, loving babies and/or natural medicine from a Catholic perspective would enjoy his writings. Linda Burton: What's a Smart Woman Like You Doing at Home?